Well, as I write this, the inaugural Evanston Business Mash Up is about 10 hours from reality, and I am a bundle of nervous energy. There are so many people who worked their butts off to get this thing together, and we’re all hoping it is a success. We are all 14 hours away from a very enjoyable, and very well-deserved, cocktail. My Tie du Jour is another that may fall into multiple Tie Week tie categories. It’s definitely striped, and some may think it ugly (love that the Tie du Monday got totally ripped in the comments…thanks JL!). It’s from Morrisoni, which just seems like someone put an ‘i’ at the end of ‘Morrison’ to make it sound Italian. 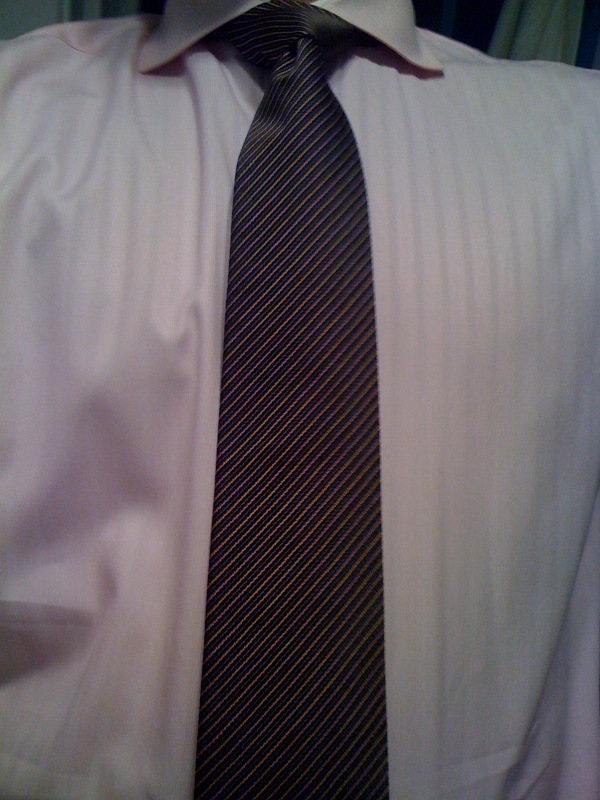 The tie is black with teeny stripes in pink, gold and green; one may need to squint to see them in this picture. On Tuesday I went to a triple-billing ribbon-cutting (just one of the fun things you get to do with an Evanston Chamber title as long as mine: Manager of Membership, Marketing & Development) on Davis Street. FlowersFlowers, Grateful Yoga and My Panini were treated to the full-court press. The gang from Downtown Evanston joined 4th Ward Alderman Don Wilson (a great guy as well as GWT alum) to celebrate their new locations, and the vitalization of the Davis Street corridor. In between staged cuttings of the ceremonial ribbon (it’s taped together for a staged cutting of the ribbon with the ceremonially large wooden scissors), I managed to welcome another member of the Guys With Ties fold. 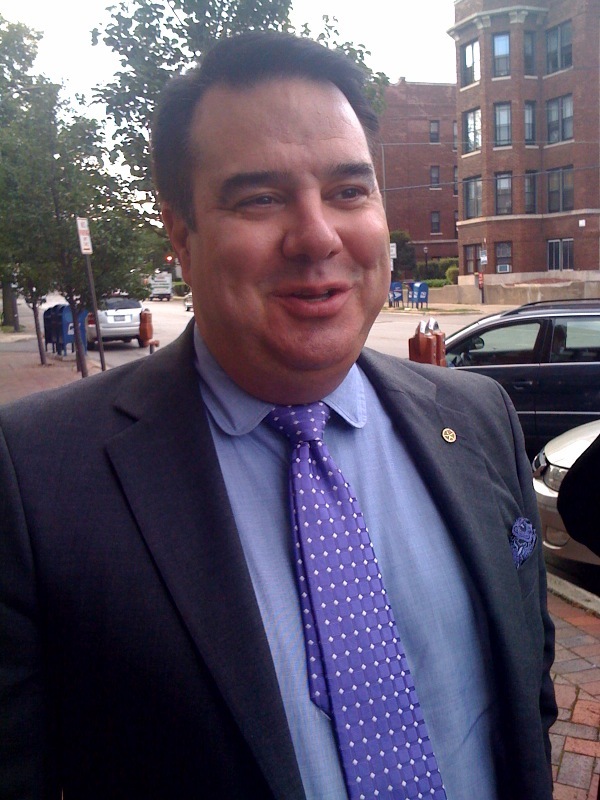 Emlyn Thomas is the new General Manager of Pensiero Ristorante, located in the Margarita European Inn on Oak Street. I ate there several times when it was Va Pensiero, and I’ve eaten there once since their new opening. It’s still wonderful, and the molten volcano chocolate dessert is perfection on earth. You just need one fork. I also had reason to stop in at one of my favorite stores in Evanston. I have shopped in my neighborhood Classy Closet for years (it used to be known as Crowded Closet), and have found some great deals over those years. Proprietor Emanuel Wilder is an imposing man who drives an imposing vehicle (huge black Hummer), but you couldn’t find a friendlier fella. 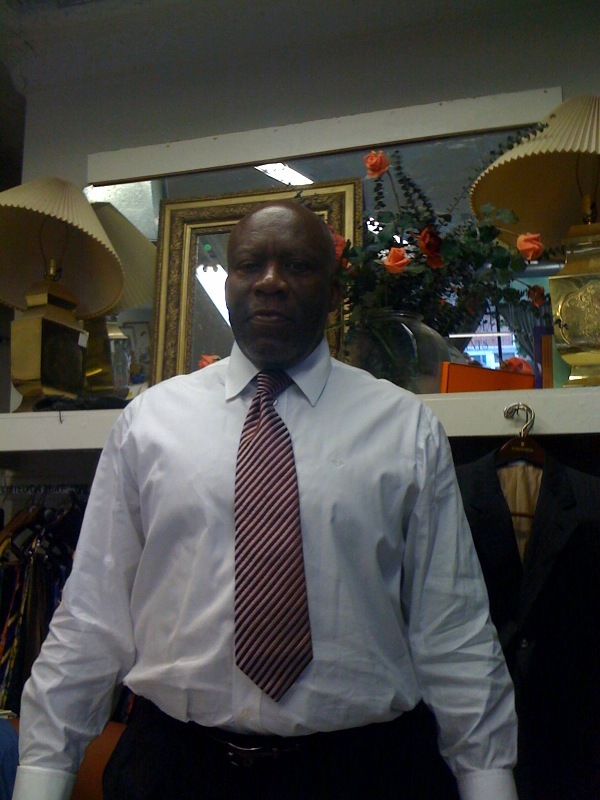 They mainly sell slightly used (pre-loved) men’s and women’s clothing on consignment, but there are some awesome treasures in there on any given day. 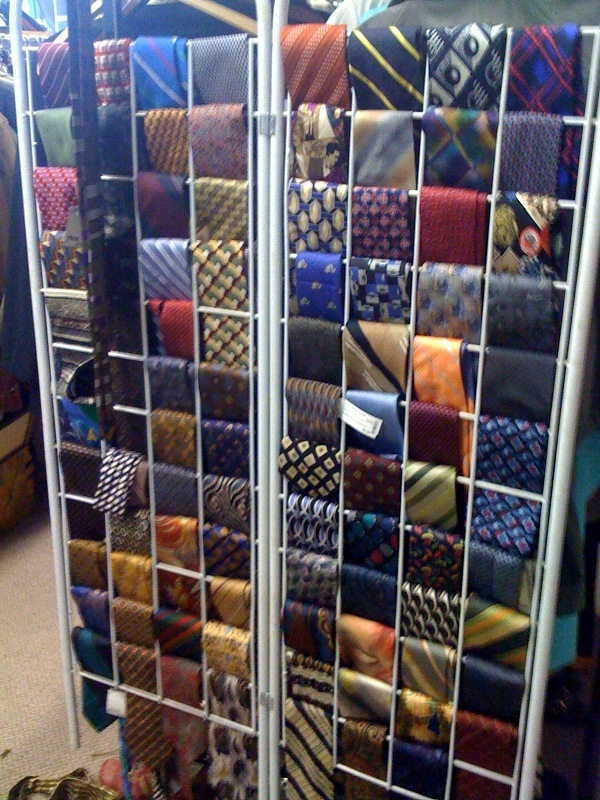 I have found great tie accessories, and they have jewelry, art, handbags and other antique-type things. Emanuel is a member extraordinaire of my treasure-hunting brotherhood, and he does find some great things. Like ties! 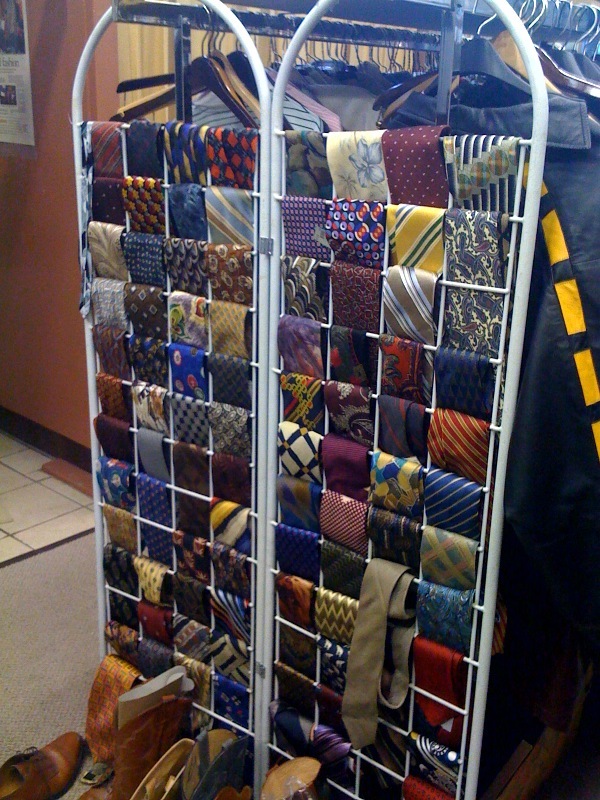 Check out these two tie racks…I have to admit I had a might bit of sensory overload, trying to mentally wear a bunch of these ties. Some fantastic labels in here, very reasonably priced. I’ll be back over there very, very soon. 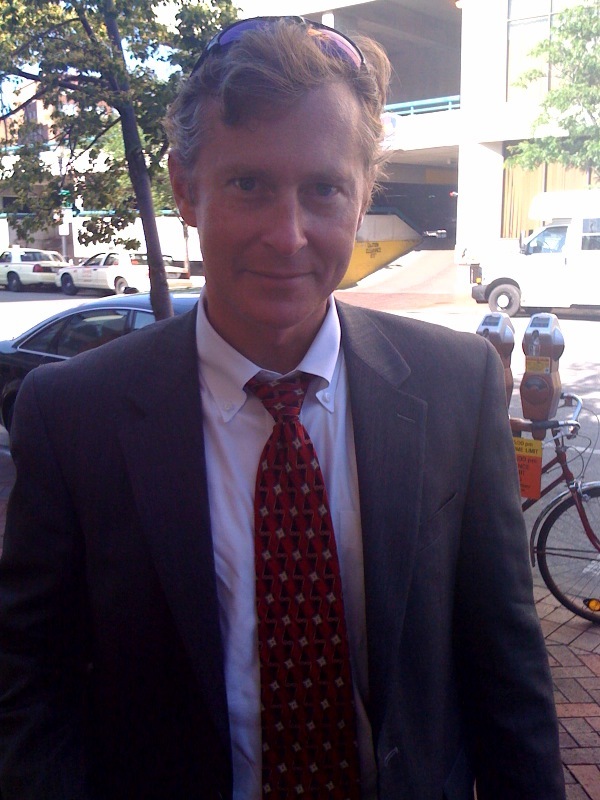 This entry was posted on September 15, 2010 at 8:18 am and is filed under Guys With Ties, Tie du Jour. You can follow any responses to this entry through the RSS 2.0 feed. You can leave a response, or trackback from your own site. where can i find these two tie racks? sorry for the belated reply. I don’t know where to find these racks. They were given to me by friends who’d had them for a long time.